For people thinking of selling their homes, spring is a very important time to start focusing on the lawn and the landscape. If you want buyers to be interested in your home, you need to show it in its best light. If it influences a buyer emotionally and visually, it can influence a buyer into making an offer. In addition, what the buyer first sees is what they think of when they consider the asking price. Selling your home in today’s real estate market can involve “home staging.” But what about the exterior of your home? It’s called “curb appeal.” In today’s challenging real estate market, smart homeowners are looking to do everything they can to maximize value and sell quickly. Not paying attention to your landscape can actually detract from the true value of your home. Creating curb appeal is a good idea for homeowners selling their houses in today’s challenging real estate market. Homes need an extra edge to stand out and get a buyer’s attention, and improving your home’s curb appeal is one of the most cost-effective improvements a homeowner can make. Your home’s first impression is the outside. Is your landscaping reflecting a true picture of your property? Let’s take a look. And, it means putting on a critical “eye” as if you are the buyer. As you arrive at your house, and exit the car, what is your first impression? Is there a clear path to the front door? Are the gardens well kept? Is the back yard also memorable … in a good way? 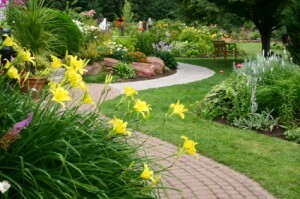 As certified landscape architects/designers, master gardeners, and skilled workmen we can do it all from underground sprinkling systems, lawn and garden fertilization, outdoor accent lighting, and lawn mowing to parking lot striping and sweeping, driveway and parking lot seal coating, fencing, water fall construction, boulder and block. Don’t wait another day to enjoy the perfect lawn you’ve always wanted. Summer is here, so call us now and get ready to sink your feet into a plush and deep green lawn for a price that won’t break the bank!